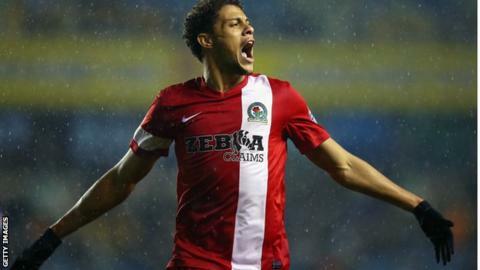 Rudy Gestede scored his 10th goal of the season as Blackburn earned a draw at Brighton. The home side had taken the lead just before the break when Gary Gardner drove in from 13 yards. Jake Forster-Caskey had a shot saved for Brighton but Blackburn levelled when Gestede headed in. Brighton pressed in the closing stages as Kazenga LuaLua saw a shot blocked and Jason Steele kept out Joe Bennett's effort. The point extended play-off chasing Blackburn's unbeaten run to seven games, while keeping Brighton out of the relegation zone. The Seagulls, who beat Wigan 1-0 in their previous fixture, had the better of the first half with Sam Baldock denied at the near post by Blackburn skipper Grant Hanley, before Steele saved a shot from the home side's striker. However, the hosts got the goal their dominance deserved as Blackburn failed to deal with Forster-Caskey's corner and Gardner struck. Brighton had further chances to increase their lead at the start of the second half, but there was little they could do when Gestede superbly headed Blackburn level, his effort going in off the crossbar and the post. The away side failed to build on that, though, and instead Brighton pushed for a winner as Alex Baptiste made a crucial block to deny Kazenga LuaLua after the Brighton winger got into a good position inside the area. Steele then made an important late save by diving to keep out a low goal-bound drive from Joe Bennett to ensure Blackburn took a point. "We have a little break now which is good because mentally you can have a little rest. "We can do something else for a few days and come back with a smile. "We can't turn the clock back; we need to accept and take responsibility, be positive and look forward. "We need to do everything we can on the training field and that is the way to go higher in the table." (On Rudy Gestede) "We felt we needed a big man, a target man and he has done ever so well. "To reach 10 is a fantastic return for him and he deserves to be in double-figures for all the hard work he's put in. "But he can't rest on his laurels. Hopefully he'll now get to 20 goals." Match ends, Brighton and Hove Albion 1, Blackburn Rovers 1. Second Half ends, Brighton and Hove Albion 1, Blackburn Rovers 1. Rohan Ince (Brighton and Hove Albion) is shown the yellow card for a bad foul. Craig Conway (Blackburn Rovers) is shown the yellow card for a bad foul. Substitution, Blackburn Rovers. Jordan Rhodes replaces Rudy Gestede. Alex Baptiste (Blackburn Rovers) wins a free kick in the defensive half. Attempt saved. Joe Bennett (Brighton and Hove Albion) left footed shot from outside the box is saved in the bottom right corner. Attempt blocked. Paddy McCourt (Brighton and Hove Albion) right footed shot from the right side of the box is blocked. Assisted by Íñigo Calderón. Corner, Brighton and Hove Albion. Conceded by Shane Duffy. Attempt blocked. Gordon Greer (Brighton and Hove Albion) header from the centre of the box is blocked. Assisted by Elliott Bennett with a cross. Substitution, Blackburn Rovers. Craig Conway replaces Tom Cairney. Corner, Brighton and Hove Albion. Conceded by Alex Baptiste. Attempt blocked. Kazenga Lua Lua (Brighton and Hove Albion) left footed shot from the left side of the box is blocked. Assisted by Sam Baldock. Markus Olsson (Blackburn Rovers) wins a free kick in the defensive half. Attempt saved. Elliott Bennett (Brighton and Hove Albion) right footed shot from outside the box is saved in the centre of the goal. Alex Baptiste (Blackburn Rovers) is shown the yellow card for a bad foul. Foul by Alex Baptiste (Blackburn Rovers). Attempt saved. Rudy Gestede (Blackburn Rovers) right footed shot from outside the box is saved in the bottom right corner. Assisted by Tom Cairney. Attempt blocked. Rudy Gestede (Blackburn Rovers) header from the centre of the box is blocked. Assisted by Tom Cairney with a cross. Corner, Blackburn Rovers. Conceded by Gordon Greer. Substitution, Brighton and Hove Albion. Paddy McCourt replaces Jake Forster-Caskey. Attempt missed. Markus Olsson (Blackburn Rovers) left footed shot from outside the box misses to the left. Attempt missed. Grant Hanley (Blackburn Rovers) header from the centre of the box misses to the right. Assisted by Rudy Gestede with a headed pass. Attempt missed. Lee Williamson (Blackburn Rovers) header from the centre of the box misses to the left following a corner.